On Sunday afternoon August 16, the USCGC Healy passed through the Bering Strait and crossed the Arctic Circle (66°33’45.7 N). Those who have previously crossed the Arctic Circle are considered “polar bears,” and Coast Guard members with this distinction were allowed to wear special red shirts to celebrate the day, a splash of color added to their everyday navy blue uniforms. Sailing over major latitudinal lines is a right-of-passage that involves a secret initiation ceremony, most especially for equator crossings. 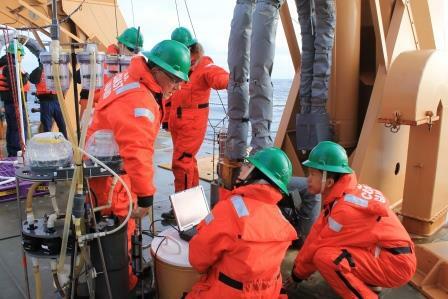 We sampled two stations within the Bering Strait along the border of the United States and Russia. Seawater flows through the strait into the Chukchi Sea which borders the Arctic Ocean and it’s important to characterize this water as it flows north. We do not have permission to sample Russian waters but stayed close enough to the border to capture water flowing through the middle of the strait. 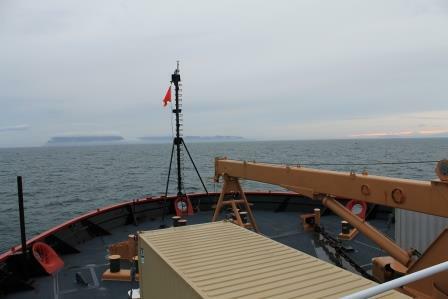 Pictured below, the ship is approaching the Diomede Islands in the center of the 51 mile wide Bering Strait – Big Diomede on the left is owned by Russia, and Little Diomede on the right is owned by the United States. 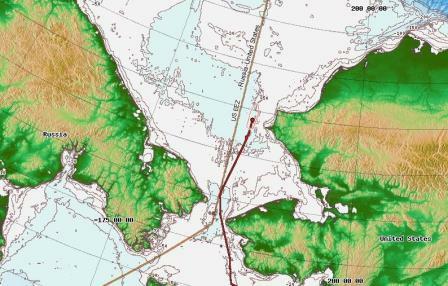 Our path through the Bering Strait is outlined in red. The USCGC Healy sailing out of Dutch Harbor, Alaska into the Bering Sea (August 9, 2015). 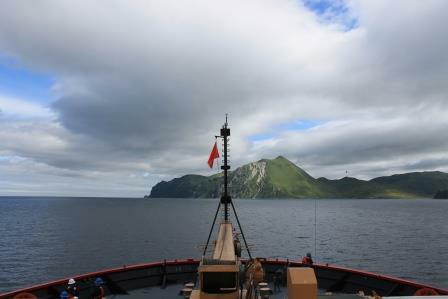 The U.S. GEOTRACES Arctic expedition departed Dutch Harbor on August 9th onboard the USCGC Healy. Shortly after departure we had our first safety drill. Everyone onboard has to practice putting on immersion suits which are kept on the boat for an emergency situation that would force us to abandon ship and jump into the water. The suits are bright orange with a flashing light and whistle, and the back has an inflatable pouch for flotation. There is a rubber cap that goes over your head and hugs tightly around the neck to prevent water from flooding the suit. The shoulders of the suits have clips to attach to a neighbor, in the water we would hook our suits together and form a giant circle of bodies that would be easier to spot from the air. It takes me about one day to get my sea-legs with the help of some medication to prevent motion sickness. After day one I am medication free, unless we run into harsh weather (>20 ft seas make me slightly queasy). Everyone handles seasickness differently. I am lucky to be able to adjust to the motion, but others, even those who frequently go to sea will continue taking medication throughout the cruise. Over-the-counter Bonine and Dramamine are the most common medications used onboard. For extreme motion sickness there is the prescription-only “Coast Guard Cocktail” which is a dose of promethazine (a mild sedative) for anti-nausea, paired with ephedrine to keep you awake. 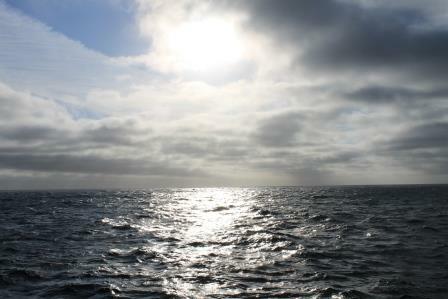 Fortunately, the Bering Sea has been kind to us this week with calm seas and fair temperatures between 40–50 °F. We had two days to test our equipment before arriving at our first station Wednesday morning. During those two days we had a major mechanical malfunction, broke the frame of our water sampler, had a minor deployment related injury, and some hiccups in the lab. But, with some replacement parts, on-site welding, a few stiches, and some tender loving care to our delicate laboratory instruments, as is well. 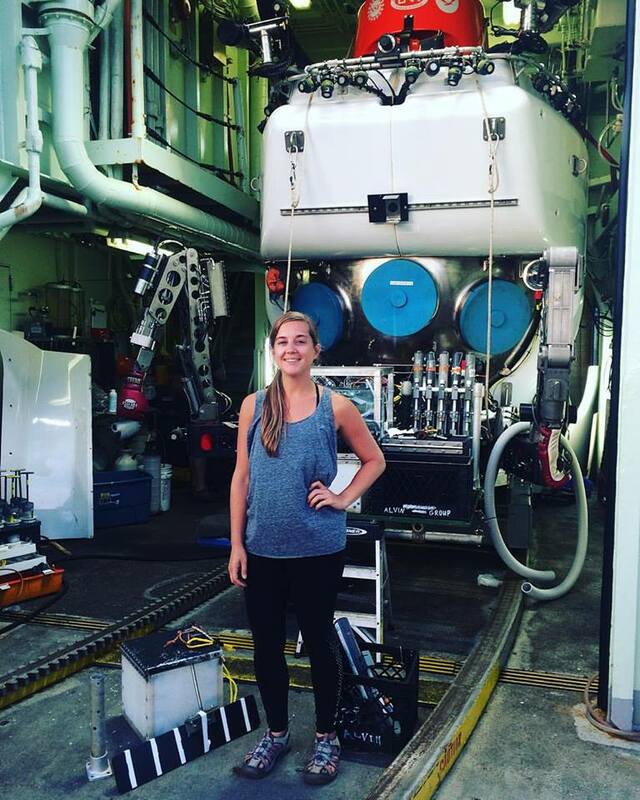 The biggest challenge of doing science at sea is the isolation. We have only the supplies that we brought and the people onboard to solve the multitude of problems that arise. 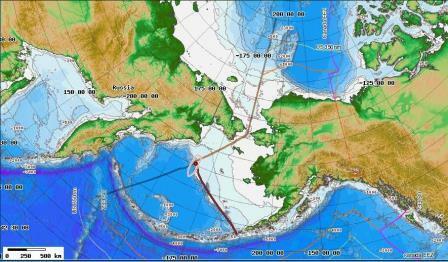 Next week we will pass through the Bering Strait and enter the Arctic Ocean. At our current latitude (60 °N) there is about 19 hours of daylight and as we travel north the days will get longer. 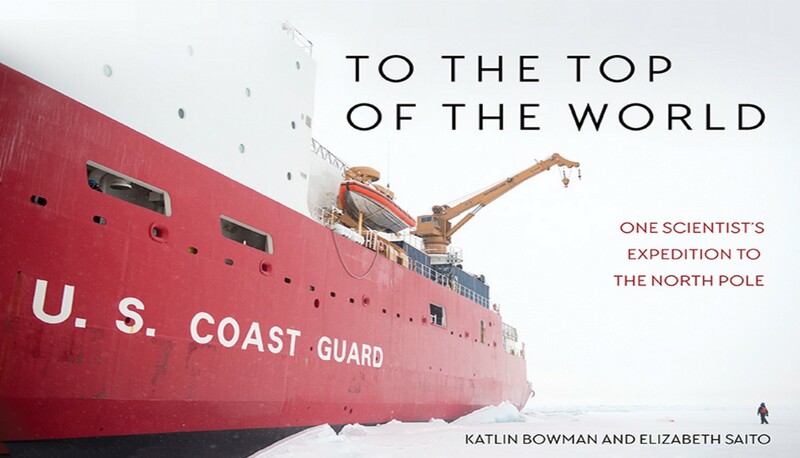 Stay tuned as we transition from open water to sea ice! 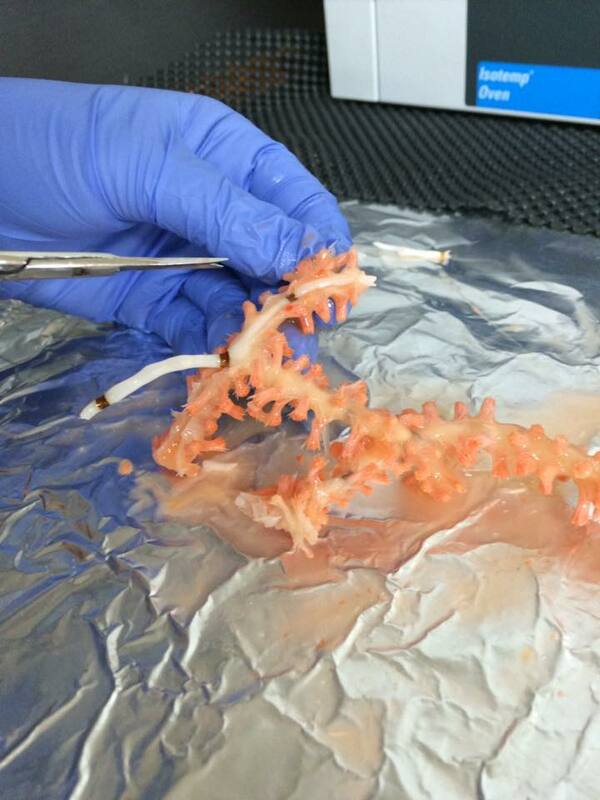 Dr. Phoebe Lam from the University of California, Santa Cruz and her team prepare to test custom designed pumps. The pumps are manually attached to a wire and lowered into the ocean where they push thousands of liters of seawater through a multitude of filters to collect marine particles. Our current position in the Bering Sea, 179 °W 60 °N. Smooth sailing in the Bering Sea this week. Middle school science teacher Bill Schmoker from Boulder, Colorado will be joining the U.S. Arctic GEOTRACES expedition through the National Science Foundation’s Polar TREC program. Polar TREC (Teachers and Researchers Exploring and Collaborating) integrates K-12 educators with scientists exploring polar regions to bring hands-on field experiences back to the class room. Bill will be documenting his journey on Polar TREC’s website and he’s already posted some great videos from the ship loading in Seattle last month! The “bubble” is built to create a clean-laboratory environment on a ship filled with metal and dust. Ultra-clean air is pumped into the plastic encasement creating positive pressure that keeps dust and contaminants away from precious samples.